Eucalyptus is a fast-growing tree with year-round green leaves. 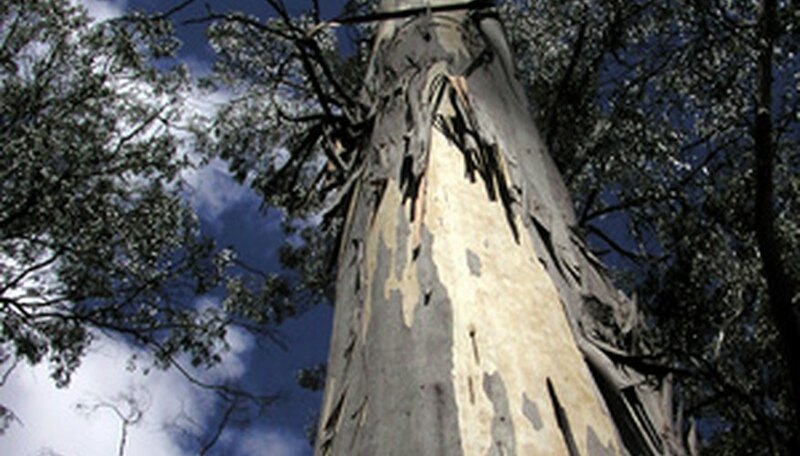 The eucalyptus tree grows best in well-draining soil and is often found on rocky hillsides. Start seeds in the early spring; transplant seedlings outside in mid-summer. Plant eucalyptus in full sun; this sun-loving tree will suffer in a shaded environment. Eucalyptus grows well in USDA Hardiness Zones 8 to 11. Fill a 4-inch planting pot with damp seed-starting potting soil mix. Most home and garden stores carry seed-starting soil mix. Start eucalyptus seeds in early spring. Place four to six eucalyptus seeds on top of the soil mix and sprinkle a thin layer of soil over the seeds. Use just enough soil to cover the seeds. Place the pot in a sunny windowsill or greenhouse. Keep the soil damp but not saturated with light applications of water daily. Eucalyptus seeds germinate in three to 10 days. Move the seedlings into individual 8-inch pots when the second set of leaves emerge. Fill the pot with well-draining potting soil mix and place one seedling in each pot. Fill in around the root system and water until the soil is evenly damp. Transplant the seedlings outside in mid-summer. Dig a hole slightly larger then the root ball of the eucalyptus sapling. Slide the sapling out of the pot and place it in the hole. Fill in soil around the root ball and pat down firmly. Water the area until the soil is damp around the root system. Spread a 6-inch layer of mulch around the base of the eucalyptus sapling before the first freeze to keep the roots warm over the winter. Start with four or more seeds. When you transplant the young seedlings after the emergence of the first leaf set, discard the weaker seedlings. Select the strongest of these seedlings to transplant outdoors.